The 2016 oil season has drawn to a close and the time has come to take stock and draw conclusions. 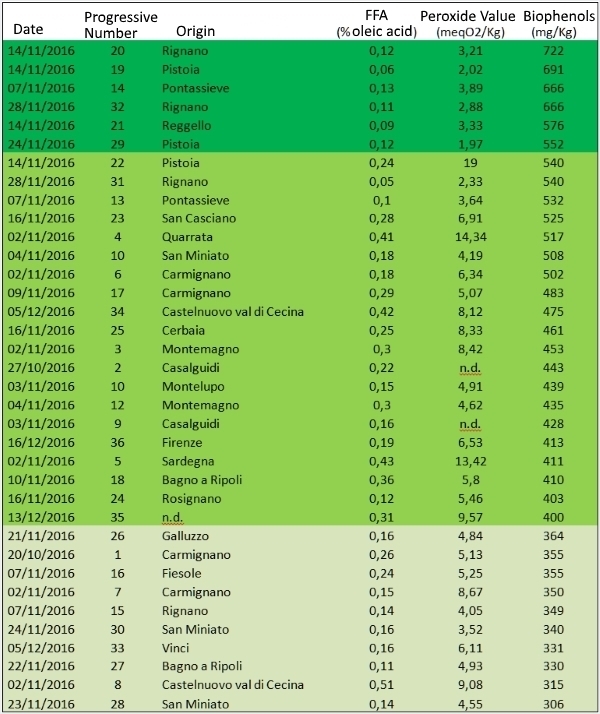 Once more, this year numerous Tuscan oil samples have been analysed at CDR laboratories, in particular from the Florence province, using the CDR OxiTester analysis system. Unfortunately 2016 was also characterised by scarce production and non-outstanding quality. As is often the case, the main underlying cause of problems was climate. If we focus on our region, Tuscany, and the province of Florence in particular, it can be said that olive growers who succeeded in salvaging their crop went on to produce a decent standard of oil, with a quality that probably exceeded expectations, if we consider the fly problem reported already in August. Memories of 2014 are all too vivid, probably contributing towards efforts to take all due precautions in the prevention of more serious problems. This resulted in a somewhat early harvest, with a shorter period between harvesting and milling. This yielded satisfactory results. Indeed, out of almost 40 samples analysed at CDR laboratories, an average acidity of 0.21% was detected, which is not bad at all. No samples were classified as “non extra-virgin”. Numerous samples were found to contain very high polyphenol values, however in general, organoleptic characteristics appear to be lower compared to expected standards for this area. Peroxide values were also good. For the first time in six years since we began analysing Tuscan oil, we used the new Total Polyphenol (Biophenols) test, calibrated by the Chemical Product Laboratory, Florence using the reference method COI/T.20/Doc. n. 29: 2009 (equivalent to NGD C 89-2010). As previously mentioned, acidity levels were surprisingly low: values over 0.4% were detected in just 4 samples. Fly attacks mostly occurred between late July and early August, therefore only part of the harvest was lost. Fresh temperatures in September and October also meant that olives hadn’t suffered extensive damage when harvested. An average peroxide value of 6.2 meqO2/Kg was obtained, similar to last year, confirming that in terms of oxidation, olive damage was limited. Rainfall in July and August resulted in the proliferation of flies while also influencing polyphenol values and therefore the organoleptic properties of oil, as we also noticed in previous years through the analysis of Tuscan olive oil quality. Based on polyphenol values, 6 very high quality oils were identified. There were numerous high quality samples, albeit devoid of exceptional or excellent organoleptic properties. An interesting consideration we can make on the quality, and in particular the presence of polyphenols in oils, concerns the milling plant used. We were pleased to confirm a previously hypothesized but never verified aspect. Very different polyphenol values were obtained from two batches of oil from the same producer and of the same variety, but milled at two different mills a few days apart. The producer is a habitual “supplier” of samples. We have always expected very high polyphenol values from his oil, due to his excellent olive grove management and the particular nature of the milling plant where the crop is processed, characterised by a production process with very short crushing times and particular focus on limiting product oxidation to the greatest possible extent. We were surprised by analysis results of the first sample supplied this year, due to particularly low polyphenol values. We thought this may be due to seasonal problems, such as ripening or other defects, but then we discovered our supplier had processed the crop at a different milling plant due to a work overload. A week later, the same type of olive, crushed at the “historic” plant, renowned for its attention to quality, yielded oil with double the amount of polyphenols as the previous batch. For example, from 349 mg/kg of Tyrosol in the first sample, a a total of 722 mg/kg was detected in the second sample a week later. This huge difference lead us to consider to what extent an excellent product can be affected by the production plant, and to what extent a plant should limit itself in terms of sheer quantity, to guarantee much higher quality. Do you want to discover how to optimise oil quality control? Click here to find out just how easy it is with CDR OxiTester. Chemical analysis of oil for monitoring Tuscan oil quality 2016 was last modified: February 26th, 2019 by CDR s.r.l.